24 hours is told in alternating chapters between the past and present. In the past chapters we learn about Laurie and her abusive marriage to Sid an award winning artist, her friendship with Mal which starts out very innocent, but takes a dark twist, as the story progresses. The present chapters focus on the 24 hours after the fire, and Laura’s journey to find her daughter, before the killer finds her. I am ashamed to admit I have never read a book by Claire Seeber (big mistake!). I was offered the chance to review 24 hours and jumped at the chance, and I am so glad I did, because I loved it. 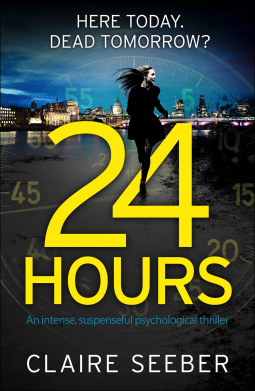 24 hours is an intense psychological thriller that will pull the reader in and keep them hooked until the very last page. The characters are well developed, and have real depth, I felt emotionally drained following Laurie’s journey, as she deals with her abusive husband, copes with Mals ex wife, and her husbands new girlfriend! This entry was posted in Claire Seeber on October 9, 2015 by lollyrugs.